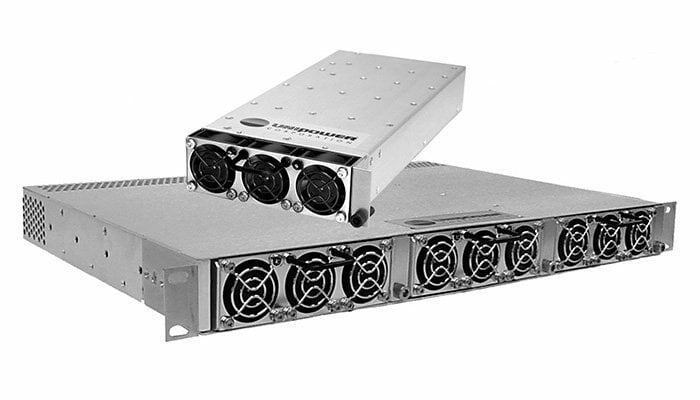 The Radian TPCMQ24-54/18 24 Volt Input 1000 Watt 54 Volt DC-DC Front-End provides up to 3kW of isolated 54.4VDC in a 1 RU 19” shelf. It is ideal for use in installations where a 54VDC charger supply separate from the main power system bus is required. The Radian TPCMQ24-54/18 24 Volt Input 1000 Watt 54 Volt DC-DC Front-End meets international safety standards and displays the CE-Mark for the European Low Voltage Directive (LVD). The Radian TPCMQ24-54/18 24 Volt Input 1000 Watt 54 Volt DC-DC Front-End is one of a family of modules that offer outputs of 12V, 24V, 27.2V, 48V and 54.4V at power levels ranging from 650W to 1200W. 1. The table does not show the independent 5V, ¼A standby output which is standard on all modules. 2. Add suffix -Z for I²C option. 3. Add suffix -R for reverse airflow. Outputs derate 20%. 4. At nominal input voltage of 24VDC or 48VDC respectively. Number 1, 2 Usage Max. 1. Blanking kit for unused position, order pt. no. 775-1450-0000. 2. To specify I²C Serial Communications append -Z to the model number.